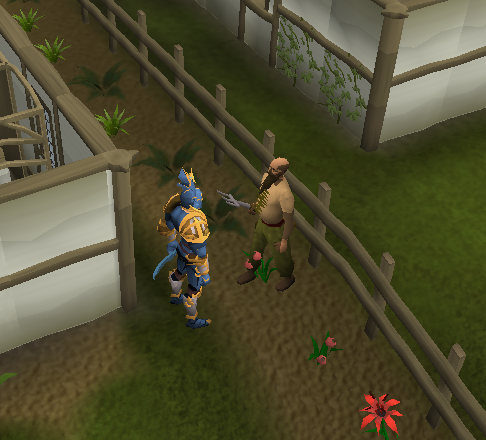 Speak with Edmond in the northwest corner of East Ardougne. 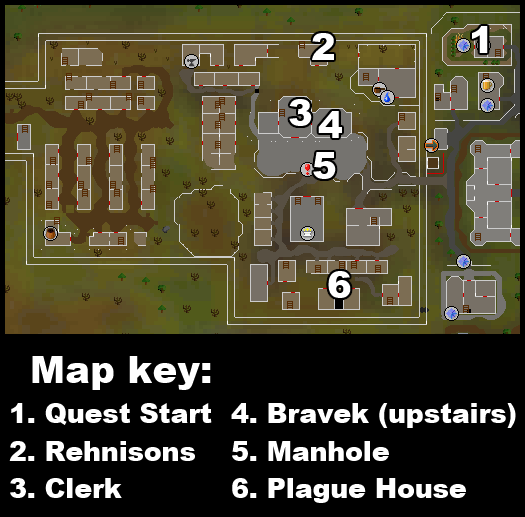 Firstly, talk to Edmond in the northwest corner of Ardougne, just north of the castle. 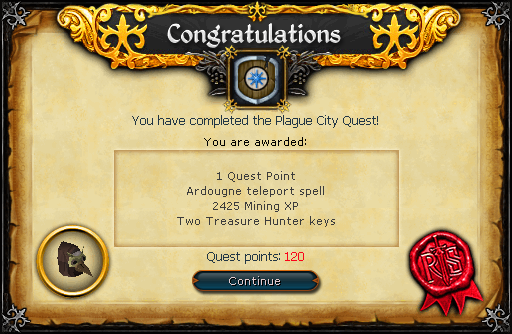 He asks you to find his daughter Elena in West Ardougne, also known as Plague City. He says that you'll need some Dwellberries for his wife to make a mask so that you can breathe in the plague conditions, and they can be found in McGrubor's Wood, just north of Ardougne. Since the woods are guarded, you'll need to go around the wood to the north side and climb through the loose railing. Be careful of the level 44 Guard Dogs wandering around, and the Dwellberries should be just southeast of the opening in the fence. They can also be bought from the Cookery Shop in the Grand Tree. Take these back to Alrena, Edmond's wife, and she will make you a Gas Mask . Before leaving, take the Picture of Elena from the table and talk to Edmond who says that you need water to soften the ground up. Before heading down into the sewer, it would be wise to gather all of the required items mentioned above to avoid having to make extra trips. You'll need 4 buckets of water to soften the ground, as well as a Spade, found in the southwest corner of the yard outside the building where you found the Picture of Elena. You cannot use the spade on your toolbelt. Ned, a man in Draynor Village can make you Rope with 4 balls of wool, or sell you some for 15gp. You can also buy some from the General Store in East Ardougne. Chocolate Dust is obtained by using a Chocolate Bar with a Pestle and Mortar. Chocolate Bars can be bought from the baker in East Ardougne, and a Pestle and Mortar should be on your toolbelt. Snape Grass is dropped by Tribesman on Karamja, or west of the Crafting Guild. Now talk to Jethick, a man near the manhole, and ask him about Elena. He looks at the Picture of Elena and says that Elena is staying with the Rehnisons, a family living towards the north side of town. He also gives you a book to return to them, so head north and try to enter. They'll let you in when you tell them that you have a book to return, and then talk to them about Elena. They'll tell you to talk to their daughter Milla upstairs who says that Elena was kidnapped. Head back to the manhole that you entered the city from, and then go south to a large building with a staircase inside. Try to enter and the Mourners stop you. Tell them that you think there may be a kidnap victim inside, and that you want to try anyway, and they tell you to talk to Bravek. Go back to the manhole, and then north to the clerk's office near the city square. Talk to the Clerk and tell him that you need permission to enter the Plague House, and that it's important. Now talk to Bravek and tell him that it's important you speak to him, but he seems to have a hangover. Ask him if he knows the ingredients to a cure. He'll give you a poorly written Scruffy Note with the ingredients on it. Use some Chocolate Dust with the Milk to make Chocolaty Milk, and then mix in the Snape Grass to make a Hangover Cure. Note: Because both Chocolate Bars and Chocolatey Milk are edible, be sure to right-click on them and select the "use" option! Give this to Bravek, and then tell him that the Mourner's won't listen to you. He should give you a Warrant , so take this back to the Plague House and try to enter. The Mourner will leave and you'll sneak inside. Go down the stairs and try to open the door. Elena tells you to find the key, which is hidden somewhere around. Go back upstairs and search the barrel just west of the stairs to find A Small Key, which will unlock the door downstairs. Talk to her and she tells you to go back to her father for a reward. Leave the house, go back down the manhole and talk to Edmond to finish the quest!